Review: Skip the Trip with Dryel's Starter Kit — a Modern Mrs. I could hop in the car, drive 20 minutes into town, drop off my dry cleaning, wait a day, drive back into town, and pay $15+ per garment. Or, I could walk into my laundry room, open up a (less than) $10 dollar box of Dryel's Starter Kit, spritz, place up to four garments in one bag, toss in the dryer, and wait 30 minutes. Which sounds better to you? Yeah.... me too. Granted, the hubs and I don't have to use the dry cleaners all that often, but I always put it off when we do because it can get pricey. I had a simple Banana Republic dress cost almost $40 to have cleaned! The very same dress they only charged me $20 the time before... No, thank you. Now, thanks to Dryel, I can safely clean our delicates from the comfort of my own home, without dropping more than $10! Dryel's Starter Kit contains one bottle of Cleaning Booster Spray, two Ultra Concentrated Refill Cloths, one Re-usable Fabric Protection Bag, an instructional pamphlet, and some coupons towards future purchases. I purchased mine from Walmart for $6.97, and it came with a $1.00 instant-use coupon. Heyyy! 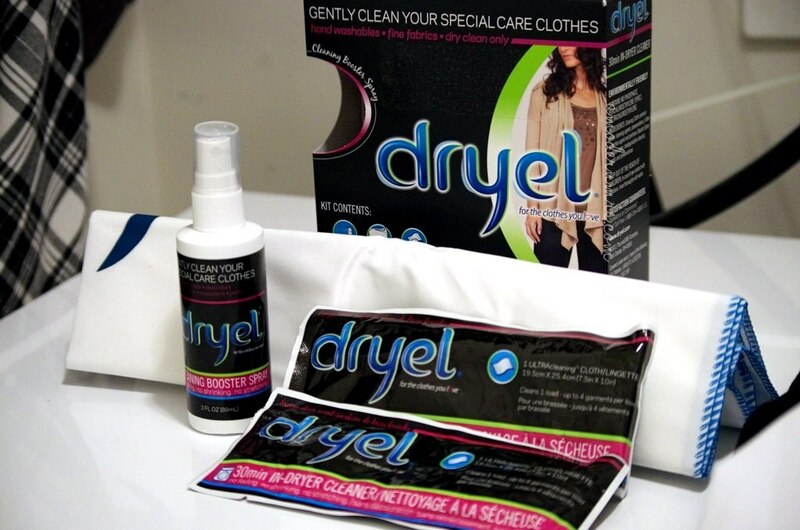 Dryel is a safe and convenient way to care for your special care clothes - hand washables and delicates such as wools, linens, and cottons - as well as your dry cleaning. 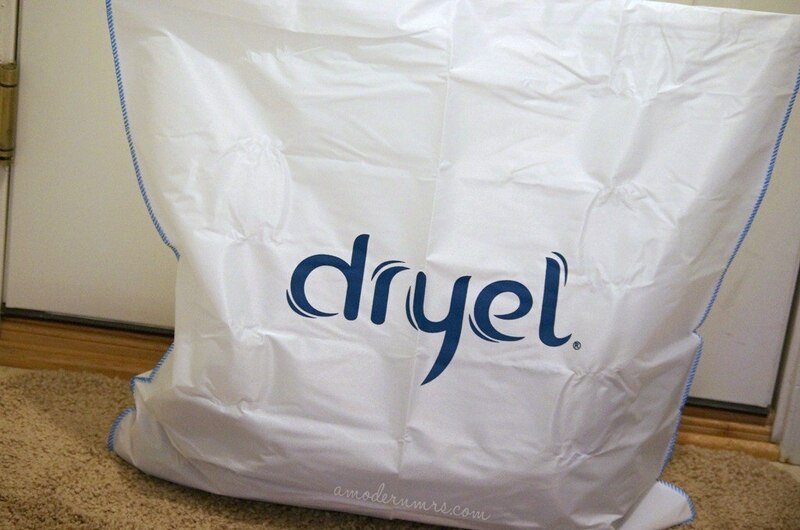 Dryel cleans clothes without harsh chemicals to help protect color and preserve shape. Clothes look newer longer - even after 50 cycles! Even better, Dryel now contains advanced cleaning technologies that remove body soils, and eliminate perspiration and odors caused by bacteria for a down-to-the-fiber clean! I tested the kit with a thrifted tux we purchased for a holiday party. It wasn't terribly soiled, but we had no clue what it had seen or who it was on, and it did need a little refreshing. Also, there was a small fabric stain on the back of the collar, and I wanted to see if the Cleaning Booster Spray could remove it. The instructions were very easy to follow, and follow them I did. I spritzed the Cleaning Booster Spray on the fabric stain, and on the underarm area of the shirt and jacket. I then placed all of the garments (jacket, shirt, pants, cummerbund, and necktie) into the Fabric Protection Bag, which had more than enough room inside. 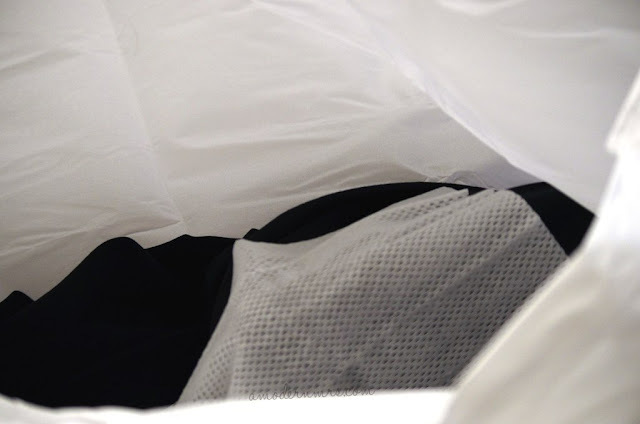 Next I opened up one of the pouches containing the ULTRAcleaning Cloth, and placed it on top of the garments. I zipped up the bag, placed it in the dryer, and turned the dryer to medium heat for 30 minutes. Speaking of the ULTRAcleaning Cloth, I was surprised to find it resembled a wet wipe. It's semi-thick, textured, and very wet, but to the point that it drips. True to its name, there was a very fresh, "clean" scent to the cloth — very similar to Downy's Clean Breeze Dryer Sheets, which we use and love. It beats my dry cleaner's smell any day! I was a little concerned the cloth may cause some bleeding since I had colors and whites mixed together, but I put my trust in Dryel and waited things out. 30 minutes later, I eagerly opened my dryer and unzipped the Fabric Protection Bag. Alas! The garments were dry, smelled clean and delightful, and nothing had bled onto the shirt! I did, however, notice the fabric stain was still there, but I can't fault Dryel. 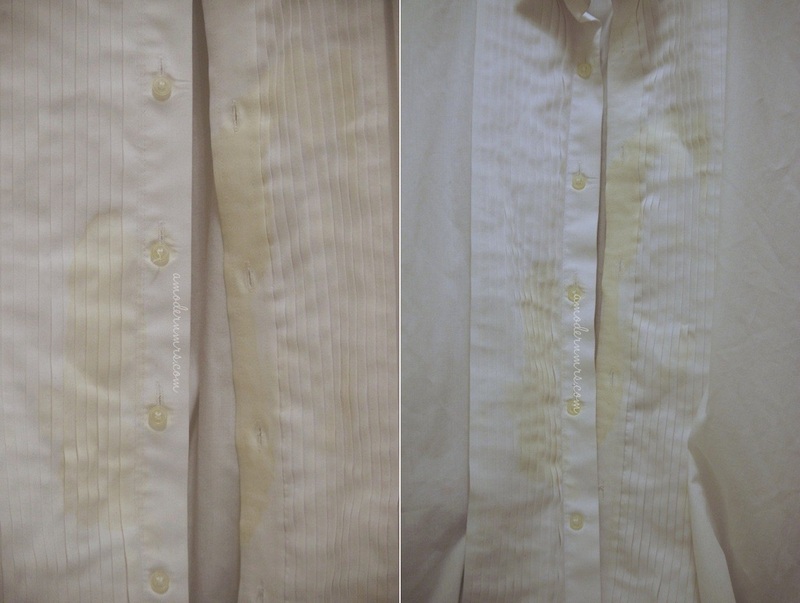 Who knows how long that stain had been set for, in which case there isn't much that would have been able to help. Unfortunately, J's shirt had a drink spilled on it during the party, and the Cleaning Booster Spray was unable to get the stain out. I'd say the spray is more for refreshing, or possibly (if you're able to get to it promptly) light stain removal, but I wouldn't count on it for something that has had a chance to sit for few hours. Even considering the unfortunate drink stain, I will definitely be using Dryel again for my dry cleaning needs! I was happy to be able to use one cloth for so many garments, and $6.97 was definitely in my price point. The garments were safely cleaned (save the after-party stain), and were left smelling wonderful, feeling soft, and unaltered. Will you be making the switch to Dryel? This is exactly what I need for my few dry-clean only items! I hate going to the dry cleaners, because I always forget to pick up my stuff for an extra week after it's ready.